Video footage circulating on social media shows a black student walking up to a white student who is walking down a hall. 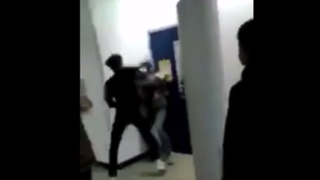 The white student attempts to avoid the black student and says, “I’m not doing anything,” but that doesn’t stop the black teen from running up on him and beginning to swing punches. Students who attend Buchanan High School in Clovis, Calif., told the Fresno Bee that the student who caught hands was one of many who participated in a racist Snapchat conversation about slaves and used the n-word repeatedly. On Thursday the student was returning to school after being disciplined for his role in the messages—although it is not quite clear if he was suspended or had merely been on independent study. The fight quickly broke out, but school staff intervened “within seconds,” putting an end to it, according to school district spokesperson Kelly Avants. Avants, however, was much more tight-lipped about the details of what happened in regards to the racist conversation. The Bee notes that the district is bound by education code and student-privacy laws from detailing disciplinary actions taken against the students who took part in the Snapchat conversation.